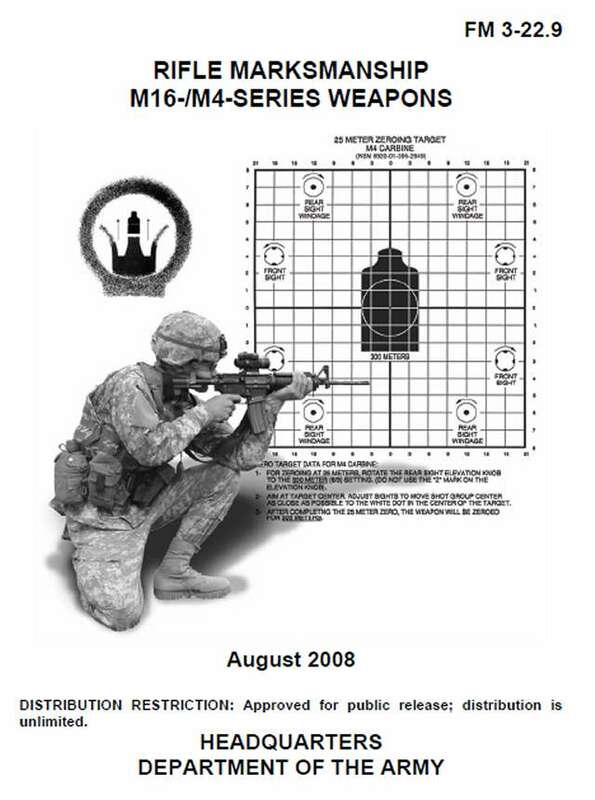 This manual provides guidance for planning and executing training on the 5.56-millimeter M16-series rifle (M16A1/A2/A3/A4) and M4 carbine. It is a guide for commanders, leaders, and instructors to develop training programs, plans, and lessons that meet the objectives or intent of the United States Army rifle marksmanship program and FM 7-0. This manual is organized to lead the trainer through the material needed to conduct training during initial entry training (IET) and unit sustainment training. Preliminary subjects include discussion on the weapon's capabilities, mechanical training, and the fundamentals and principles of rifle marksmanship. Live-fire applications are scheduled after the Soldier has demonstrated preliminary skills. The new Army total marksmanship training strategy, to include specific strategies for the United States Army Reserve (USAR) and the Army National Guard (ARNG). Information about the advanced combat optical gunsight (ACOG), the AN/PEQ-15 advanced target pointer/illuminator aiming light (ATPIAL), various thermal sights, and the MK 262 round. Information about the alternate qualification record fire courses (known distance [KD] record fire, 25-meter scaled target alternate course, 15-meter scaled target alternate course). Information about the rapid magazine change and barricade transition fire for short-range marksmanship (SRM). Changes to all of the scorecards. *This publication prescribes DA Form 3595-R (Record Fire Scorecard), DA Form 3601-R (Single Target—Field Firing Scorecard), DA Form 5239-R (100-, 200-, and 300-Meter Downrange Feedback Scorecard), DA Form 5241-R (Single and Multiple Targets—Field Firing Scorecard), DA Form 5789-R (Record Firing Scorecard—Known-Distance Course), DA Form 5790-R (Record Firing Scorecard—Scaled Target Alternate Course), DA Form 7489-R (Record Night Fire Scorecard), DA Form 7649-R (Squad Designated Marksman—Record Fire I and II Scorecard), DA Form 7650-R (Squad Designated Marksman—Position Evaluation), and DA Form 7682-R (Combat Field Fire Scorecard). This publication applies to the Active Army, the Army National Guard (ARNG)/National Guard of the United States (ARNGUS), and the US Army Reserve (USAR).